A giant telecom, a big cruise ship operator, and an on-the-move tech company were three of the more prominent payout hikers last week. In spite of the hits the overall market has taken recently, many companies are doing well and lifting their dividends, trading volatility be damned. Last week was a good example of this. Although there weren't a lot of raises, we saw more than one high-profile company add to its distribution. As a result, for this installment of our series, we've got a trio that features a pair of familiar names, plus a busy company in the IT sector. One of America's two big incumbent cell phone service providers, this giant company is also a steady and reliable dividend payer. It tends to hike its quarterly distribution once every year, and for 2015, that time came last week -- Verizon bumped it 3% higher to almost $0.57 per share. VZ Dividend data by YCharts. It's a typically cautious raise for the company, which is fitting as these are cautious times. Aggressive discounting by rivals has limited growth, with Verizon posting only a 4% year-over-year increase in revenue -- to $32.2 billion -- in its most recently reported quarter. The bottom line, meanwhile, grew by less than 1% to land at just over $4.2 billion. This limited-growth trend doesn't look like it'll shift anytime soon. The company lowered its guidance for fiscal revenue growth by a full percentage point, to 3% from the previous anticipation of 4%. Still, I don't think Verizon's dividend is in trouble. The company might not be growing dynamically, but it's well in the black. Its free cash flow tips into eight-figure territory and is more than enough to at least maintain the current payout. 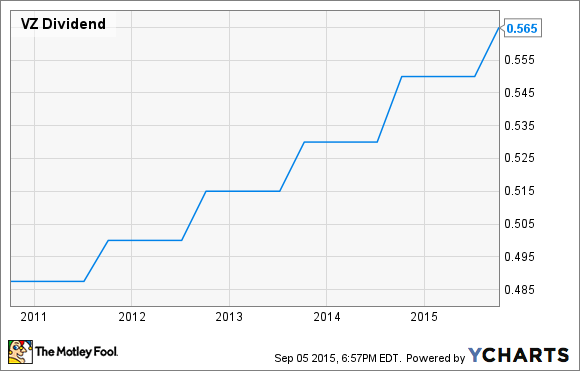 Verizon's upcoming dividend is to be dispensed on November 2 to shareholders of record as of October 9. All aboard for a higher dividend at this veteran seafarer. Royal Caribbean Cruises has lifted its quarterly payout by a robust 25% to just under $0.38 per share. These are days of optimism for the company. In its Q2, on the back of favorable currency movements and relatively cheap fuel costs, it managed to grow its net profit by 34% on a year-over-year basis to nearly $185 million. That was on the back of a 4% rise in the top line to $2.1 billion. The company clearly believes the good times will last for a bit; it's lifted its estimate for full-year adjusted earnings. It now believes it will take in $4.65 to $4.75 per share, a substantial improvement over the previous projection of $4.45 to $4.65. It's also well above fiscal 2014's EPS of $3.43. 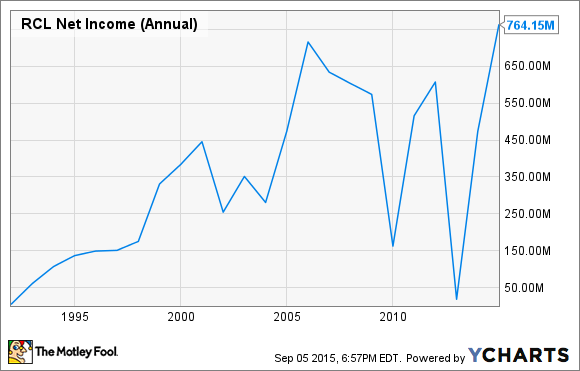 RCL Net Income (Annual) data by YCharts. Royal Caribbean's dividend will probably be secure as long as those fuel costs and currency movements stay in its favor. Past that, however, it might come under strain -- the company's free cash flow figure tends to sway between surplus and deficit. So, the future of the payout is hardly assured. Royal Caribbean's new dividend will be paid on October 6 to stockholders of record as of September 18. Many tech companies aren't eager to pay dividends; this one is an exception. As is its habit, serial payer and raiser Avago Technologies has lifted its quarterly payout yet again, raising it by 5% to $0.42 per share. It has the fundamentals to support the generosity. The most recently reported quarter saw it post sales that rose by 37% on a year-over-year basis to $1.3 billion, while adjusted earnings advanced by a robust 78% to $660 million. But there's a bit of a catch. A goodly portion of the company's growth is due to acquisitions; it buys assets nearly as much as it lifts its dividend. Over the past year or so, it's effected several asset purchases, including a massive buyout of chip maker Broadcom. Despite the solid operating results, Avago Tech's appetite for buyouts is going to put a strain on its finances. Last year, it took on over $5 billion in debt, and it plans to take on $9 billion or so to finance the cash portion of the Broadcom buyout. 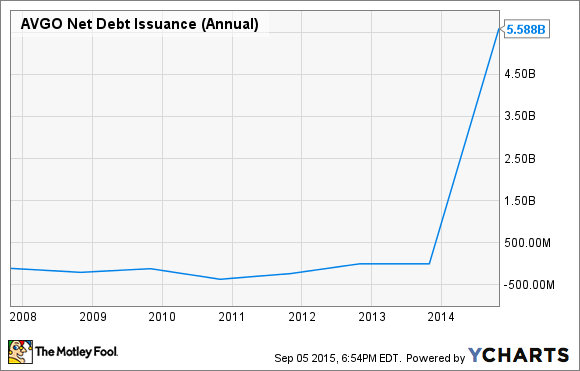 AVGO Net Debt Issuance (Annual) data by YCharts. With that firmly in mind, investors would be wise to closely watch how that burden impacts its dividend regime in the future. Avago Technologies' upcoming distribution is to be handed out on September 30 to holders of record as of September 18.